WELCOME TO DAY 3 OF MY 12 DAYS OF CHRISTMAS DECORATING, CRAFT AND GIFT IDEA CHALLENGE. Simple, easy, elegant and sooooooo inexpensive. Have you ever just been somewhere (in this case the Dollar Tree) and you see something that is completely plain and simple and an idea pops in your head. 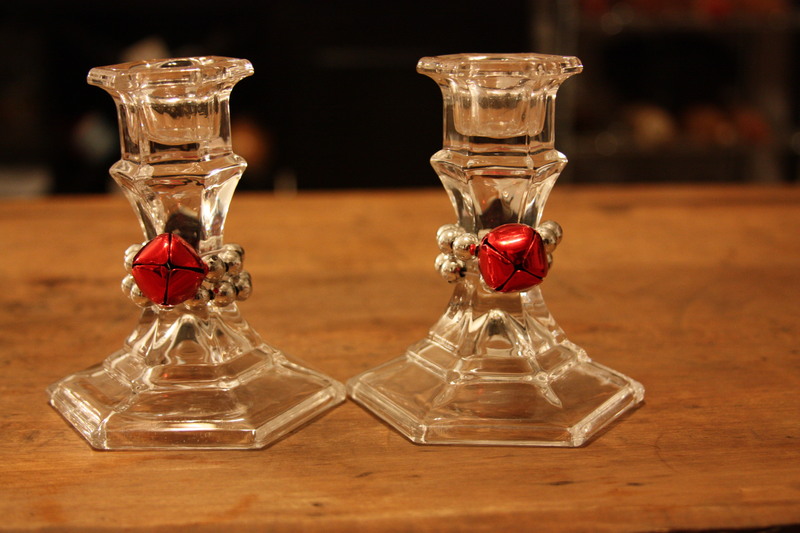 That’s how these candlesticks came about. I was at the Dollar Tree picking up gift bags and tissue and I saw these little jingle bell bracelets. Not knowing what I’d do with them (wear one, use as a stocking stuffer or perhaps a cat toy) I tossed a few in the cart and thought to myself, oh you’ll find something to use them for later. 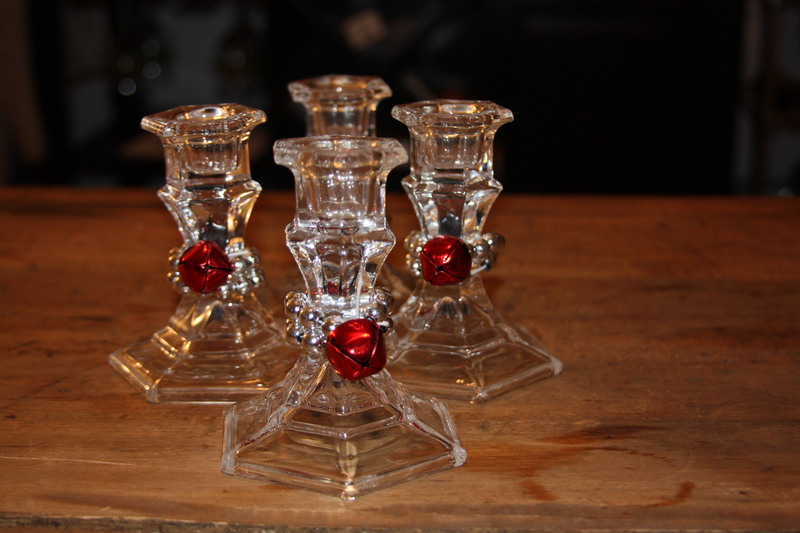 I walked by a box on the floor that had glass candlesticks sitting in them (they hadn’t even made it to the shelf). My first thought was – these are those candlesticks people make the Redneck wine glasses with, I should buy some and make Redneck wine glasses for next summer on the patio. 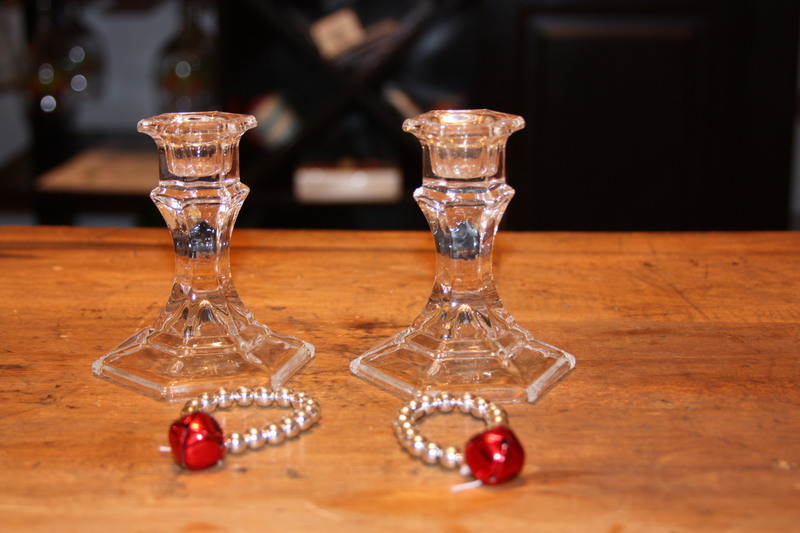 I put them in the cart and put the bracelets on top of them and BOOM – lightbulb….I wondered if the bracelets would fit around the candlestick??? Yep they sure did. Now when I got home, I thought I was pretty smart, all that and a bag of chips!!! I decided to check on-line and Pinterest to see if anyonelse had done this and OF COURSE they did…..dah!!! So to all you other crafty folks out there I SALUTE you!!! Well done, pat on the back (insert applause here). Even though I wasn’t the first to come up with this, I still think it is A Wandaful Thing!!! This entry was posted in Decorate, DIY and tagged Challenges, Crafts, Decorate, DIY. Bookmark the permalink. Nicely done Wandaful, nicely done!